running, corgis, and some other things. Barkwells’ check in time is 3 pm and we needed to drive more than 12 hours from Chicago to get there. So we left our house at 2 am. There were still more cars on the road than I expected because of Labor Day. Last year, Jeter got a little bit anxious during the long drive. To help him to stay calm, we brought his crate this year. For him, his crate is a very comfortable and safe place and he loves to be in it. We secured his crate in the back seat and put him in it. Cappy wore her car vest and we used a tether to connect to a seat belt. It was a long long drive but my corgis did a good job. Driving all night was not an easy thing. I don’t know how many times we asked each other “Are we there yet?” 🙂 We drank cup after cup of coffee. The weather for our drive this year was rainy and foggy, but still better than last year when it rained heavily as we drove through Indiana. One thing different from last year was we didn’t need to stop so often to get gas 🙂 Our Prius V did a great job. Even though it struggled a bit when we drove uphill in the mountains, overall it was a smoother and more comfortable drive. We listened to so many different kinds of songs using Pandora. We stopped several times not for gas but to stretch our legs and the corgis’ legs. Night changed to day and flat scenery changed to hills. 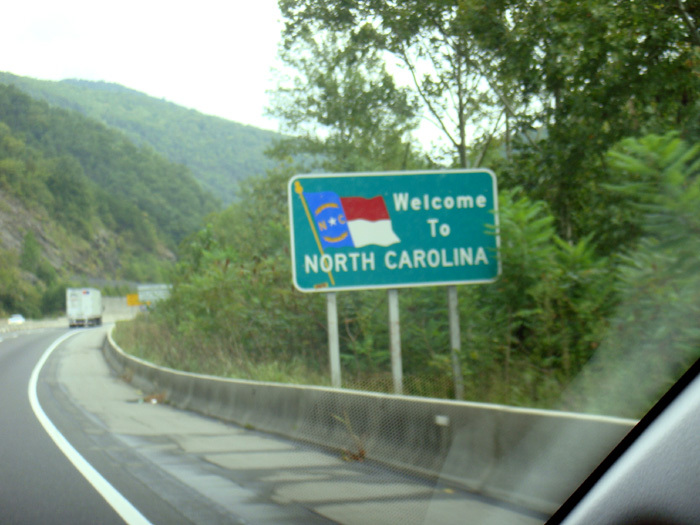 After crossing 4 states borders – IN, KY, TN, NC – we finally arrived at our destination around 3:30 pm on Monday, September 3rd. It was about 680 miles from our home. 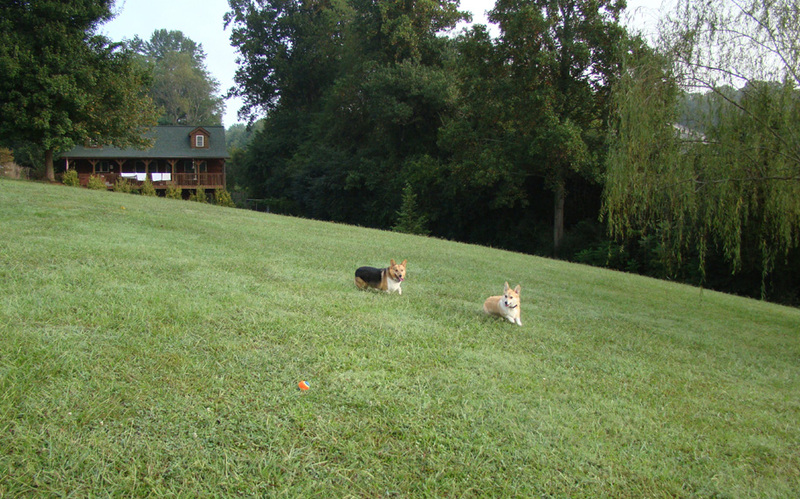 As soon as we finished the check in, the first thing we did was put our corgis in the fenced yard of our cabin. They loved to run around after the long drive 🙂 Then we started to move suitcases and many things to the cabin. The cabin we stayed in this year was ‘Peppermint Patty’s’. 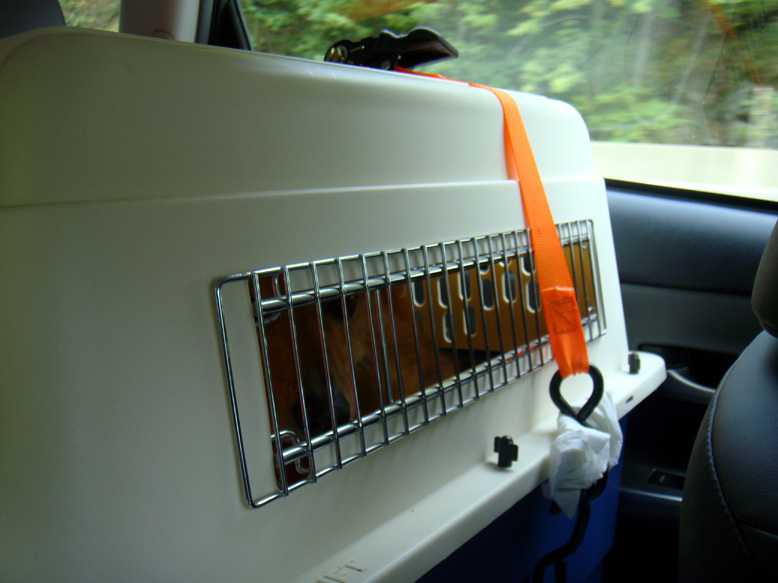 It is a bigger cabin than the one we stayed (Snicker’s) in last year. Jeter and Cappy explored the yard, inside of cabin – room by room – and the porch. They looked so comfortable 🙂 After we put things away, we took them to the 7 acres of fenced meadow. Jeter and Cappy ran like the wind. They looked so happy. That’s why we came here. Our happy corgi vacation just started. Jeter and Cappy running on the meadow. The cabin behind is the one we stayed in – Peppermint Patty’s. This entry was posted in Corgis, Other things and tagged barkwells, car, corgi, dog, NC, vacation by runningcorgi. Bookmark the permalink.